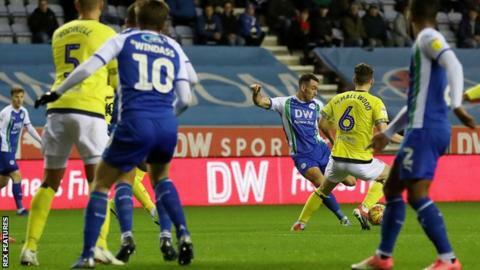 Goals from Gary Roberts, James Vaughan and Callum McManaman gave Wigan a deserved victory over Blackburn at the DW Stadium. Midfielder Roberts opened the scoring with a stunning long-range strike on 37 minutes, before Vaughan converted from the spot after Rovers midfielder Jack Rodwell brought down Joshua Windass. A late own goal from Burn made for an interesting finish as Blackburn halved the deficit, but Callum McManaman's finish three minutes later sealed victory for the Latics. The result marked Wigan's first win in six attempts in the Championship, while Blackburn have lost three of their past four away league matches. After a slow start to the game, Wigan took control on the half-hour mark when Burn's effort hit the bar, with Roberts' stunning goal from long range coming just two minutes later. After Vaughan's firm penalty doubled the hosts' lead in the second half, Paul Cook's side hit the woodwork twice before Burn bundled into his own net. But McManaman's second goal of the season quickly put any Rovers' hopes of a comeback to bed after excellent forward play by Windass. Rovers manager Tony Mowbray made four changes to his team for the trip to Wigan, but his side were under par throughout, and rarely threatened a Wigan team who have not lost to Rovers at home since 2007. If it had not been for the heroics of Rovers goalkeeper David Raya, the scoreline would have been much worse for the visitors, who have now lost three of their last four away league matches. "The lads have been working hard. They thoroughly deserved the win. "This squad is together and they want to cover every blade of grass for each other. "That's the league - you're up against quality opposition and quality players and you've got to pit your wits against them." "There might be another four or five changes at the weekend if that's the performance level to be honest - there's some players that deserve an opportunity. "That's the first angry words I've seen among our footballers in 20 months in the dressing room, which is good to an extent. "My job is to keep a rein on it and make sure they use their anger and frustration in the right manner." Match ends, Wigan Athletic 3, Blackburn Rovers 1. Second Half ends, Wigan Athletic 3, Blackburn Rovers 1. Attempt saved. Callum McManaman (Wigan Athletic) right footed shot from the left side of the box is saved in the centre of the goal. Assisted by Reece James. Attempt saved. Charlie Mulgrew (Blackburn Rovers) header from the centre of the box is saved in the top centre of the goal. Assisted by Craig Conway with a cross. Corner, Blackburn Rovers. Conceded by Christian Walton. Corner, Blackburn Rovers. Conceded by Sam Morsy. Attempt blocked. Bradley Dack (Blackburn Rovers) right footed shot from outside the box is blocked. Assisted by Craig Conway. Goal! Wigan Athletic 3, Blackburn Rovers 1. Callum McManaman (Wigan Athletic) left footed shot from very close range to the bottom left corner. Assisted by Josh Windass. Own Goal by Dan Burn, Wigan Athletic. Wigan Athletic 2, Blackburn Rovers 1. Attempt missed. Derrick Williams (Blackburn Rovers) header from the centre of the box misses to the right. Assisted by Craig Conway with a cross following a set piece situation. Hand ball by Sam Morsy (Wigan Athletic). Substitution, Blackburn Rovers. Craig Conway replaces Ryan Nyambe. Substitution, Wigan Athletic. Callum Connolly replaces Gary Roberts. Substitution, Wigan Athletic. Callum McManaman replaces James Vaughan. James Vaughan (Wigan Athletic) wins a free kick on the right wing. Gary Roberts (Wigan Athletic) wins a free kick in the defensive half. Amari'i Bell (Blackburn Rovers) wins a free kick in the attacking half. Attempt missed. James Vaughan (Wigan Athletic) header from the centre of the box misses to the right. Assisted by Lee Evans with a cross. Attempt blocked. Kal Naismith (Wigan Athletic) left footed shot from the left side of the six yard box is blocked. Attempt blocked. Josh Windass (Wigan Athletic) right footed shot from the right side of the box is blocked. Assisted by Reece James. Attempt missed. Adam Armstrong (Blackburn Rovers) right footed shot from outside the box misses to the right. Assisted by Derrick Williams. Attempt saved. Lee Evans (Wigan Athletic) right footed shot from outside the box is saved in the bottom left corner. Assisted by Reece James. James Vaughan (Wigan Athletic) wins a free kick in the defensive half. Substitution, Blackburn Rovers. Ben Brereton replaces Richard Smallwood. Offside, Wigan Athletic. Lee Evans tries a through ball, but James Vaughan is caught offside. Attempt missed. Dan Burn (Wigan Athletic) header from the centre of the box is close, but misses to the left. Assisted by Kal Naismith following a set piece situation. James Vaughan (Wigan Athletic) wins a free kick in the attacking half. Goal! Wigan Athletic 2, Blackburn Rovers 0. James Vaughan (Wigan Athletic) converts the penalty with a right footed shot to the high centre of the goal.